Gigli, Erna Berger. Both the German and the Italian versions, on 2 DVD’s. DVD 1: dialog in German, with English subtitles. Gigli, Erna Berger. Traviata, Hansel, Bohème + “Di quella pira” and songs. Gigli speaks his lines in the dialog. Singing is in Italian. (1936). 88m. B&W. DVD 2: dialog in Italian, with English subtitles. Most of the musical selections are the same. An actor dubs Gigli’s speaking voice. 76m. B&W. Booklet contains a brief biography of Berger. See a video clip below. This selection is from the German version. 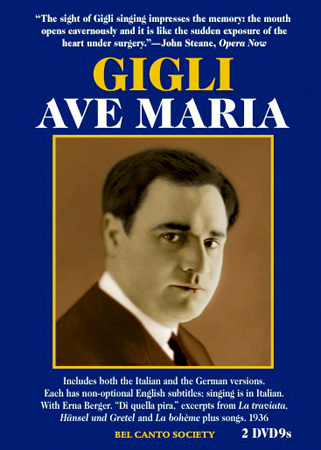 “Gigli is cast twice, in his first and second films, Non ti scordar di me (in English, despite its title) and Ave Maria, as a middle-aged singer who has recently lost his wife. In the first he marries a young girl who’s on the rebound from an affair and remains faithful to him (just) when her lover returns–again through the appeal of his voice. In the second his singing wins him the love of a cabaret artist who has been inveigled into conning him. In both Gigli has ample opportunities to deploy his art, the true, honest quality of his singing saving him and the plot from sentimentality. “Ave Maria and Non ti scordar di me are irresistible. The sweetness of Gigli’s tone is a reflection of the sweetness of the personality. It’s well seen in both these films. As in opera, one’s disbelief in situations is suspended. “In theory, Gigli was unsuited to the cinema, at least for young, romantic roles, but it’s extraordinary how successful he is and how quickly–within a couple of scenes. One is willing him to succeed, and with his voice, he doesn’t have any problem. It’s one of the most glorious and beguiling voices; it’s more than beautiful; his voice is like a siren, in the classical sense, it beckons you to his island. The plot: A tenor is betrayed by a woman and expresses his rage through singing a performance of Traviata. In the Traviata denunciation scene Gigli is at his most impassioned, and in the Bohème aria he is at his sweetest. He sings the high C of “Che gelida manina” on the vowel “ah” (“la speranza”) instead of on the written “eh” (“la speranza”), and as he did in Traummusik (Video #508). Ernesto De Curtis wrote “Soltanto tu, Maria” and “Sei tu, Maria” and Alois Melichar wrote “Anima mia” for this film. For a biography of Erna Berger, please click here. Click here to see notes on the two versions of Ave Maria and the audio restoration.